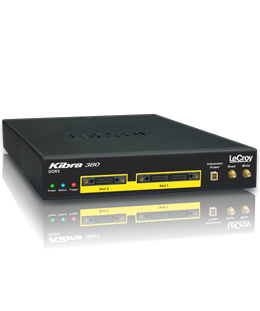 LeCroy Corporation, the worldwide leader in protocol test solutions, has introduced a family of DDR3 SO-DIMM interposers for their Kibra 380 DDR3 protocol analyzer platform. The new interposers operate non-intrusively to monitor SO-DIMM memory at speeds up to 1600 MT/s. The new DDR3 SO-DIMM interposers in combination with LeCroy's Kibra 380 protocol analyzer provide powerful DDR3 test and verification for laptops, server, mobile, and embedded computing applications. Designed for use with the LeCroy Kibra 380 protocol analyzer, the new interposer sits in-line between the SO-DIMM module and the SO-DIMM memory socket. Rigid Flex connectors make it easy to attach the interposer to the SO-DIMM target memory slot. The SO-DIMM module itself is inserted in the probe's extender socket where it operates normally. Developers can add an optional second interposer to monitor dual slot SO-DIMM memory channels. "The DDR3 SO-DIMM form-factor is gaining traction in blade server systems as well as mobile computing applications and these developers will surely benefit from LeCroy's low cost solution for DDR3 memory testing", said Michael Romm, vice-president of product development at LeCroy's Protocol Solutions Group. "With its small size, the Kibra 380 offers easy connection to the SO-DIMM memory channel where it automatically detects JEDEC timing violations." The Kibra 380 system was introduced in February 2011 and is a standalone DDR3 protocol analyzer that provides traditional waveform views as well as decoded state listings that show DDR3 command timing. Specialized trigger logic is capable of identifying over 65 JEDEC violations across all ranks and banks simultaneously. Using non-intrusive slot interposer probes, the system provide loss-less capture of address, command and control signals (ADD/CMD/CNTRL). By focusing on state-based capture and excluding the data signals, the system can record over one billion event samples, which is 8x more than the memory depth provided with today's logic analyzer-based solutions.